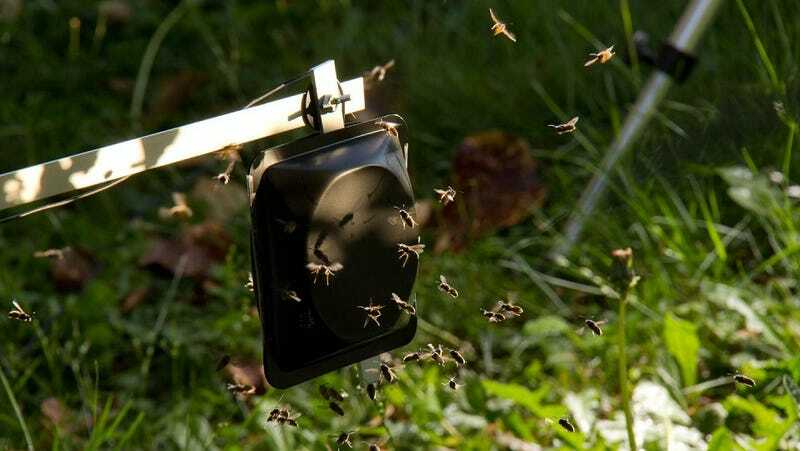 Wasp researchers have come up with a cheap device that can be put together to measure how many times wasps sting. They found out that wasps sting a lot, especially if something already has wasp venom in it. Each target is formed by two conjoined black plastic weigh boats that generate distinct percussive sounds when struck by attacking wasps. A battery-powered microphone inside each target converts the sounds into electrical signals that are transferred to a digital audio recorder. These audio files are then split into left- and right-channel files, saved as 16-bit WAV files, and the strikes to each target are counted using the open-source software SoundRuler. The number of hits each target gets can be measured audibly. In this case, the researchers were interested in seeing whether the number of hits the target received varied depending on the presence of wasp venom. Wasp venom contains pheromones, which alarm nestmates and encourage them to attack. Get stung by one social wasp and the rest of its species will be gunning for you. This study revealed a new twist: three different species of social wasps, Vespula alascensis, V. germanica and V. pensylvanica, all respond to each other’s pheromones. Wasps are possibly helping each other out, or just guarding their own self-interest. Once you’re marked, you’re marked.